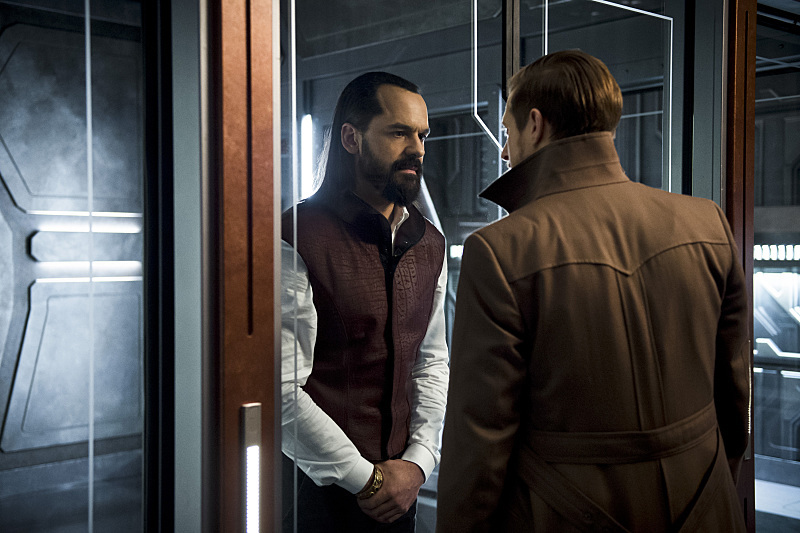 When we last left the Legends, they had managed to capture Vandal Savage. However, they are keeping him alive because he brainwashed Carter's mind. If Savage dies, Carter's mind is forever locked in the brainwashed state. Now they search for another way to defeat Savage and save the world. This upcoming Thursday is the season finale of DC's Legends of Tomorrow, so let's find out what the Legends will have to face. To the jump ship! Episode 14: "River of Time"
For me, this episode was so-so. There were some great lines from Sara and Snart, interesting points made by Rip, and heart-wringing moments during the flashbacks. However, the decisions most of the Legends made during this episode were ridiculous, annoying, and frankly stupid. Just when I thought they were coming together as a team, they crumble again into their old ways of mistrust, self-pity, and selfishness. Let't just say, I was disappointed with most of this episode. -The flashbacks were interesting, though in my opinion, not long enough. I'm assuming most of them take place right before each of them decides to join the Legends and save time itself. Most of them were sad, especially Dr. Stein's. They each featured a prominent figure in each of the Legends' lives (Jax--his mother; Ray--Felicity; Sara--Nyssa; Stein--his wife). I guess these flashbacks served to show us what each person has to lose if they don't succeed in defeating Savage. It shows that each Legend is worth something and has at least one person who loves them and is waiting for them back in 2016. -Snart, of course, had some great one-liners. He wasn't as prominent in the episode as others, and he and Rory both didn't receive a flashback, which kind of disappointed me. However, what they both contributed to this episode was great, as always. While I didn't approve of all their actions, I did like how willing they were to join the fight and distract Savage so the others could maneuver through the time streams. Also, Rory's comments about snacks in the future is still my favorite. -Sara also showed a lot of promise in this episode. Despite her doubts about Rip, she's still willing to fight. I love seeing how much she's grown. Also, her comments back to Savage were golden. And she piloted the Wave Rider, which was fantastic! -Dr. Stein's efforts to save Jax were wonderful. Sometimes he seems to be the grown-up, level-headed one of the group. This usually means his character development isn't as obvious. But this episode showed how he has developed into a stronger, more compassionate, and less selfish character. He was thinking only of saving Jax, of doing whatever it took. He even has risked his own life and the possibility of returning to his wife in order to save Jax. That was pretty amazing. 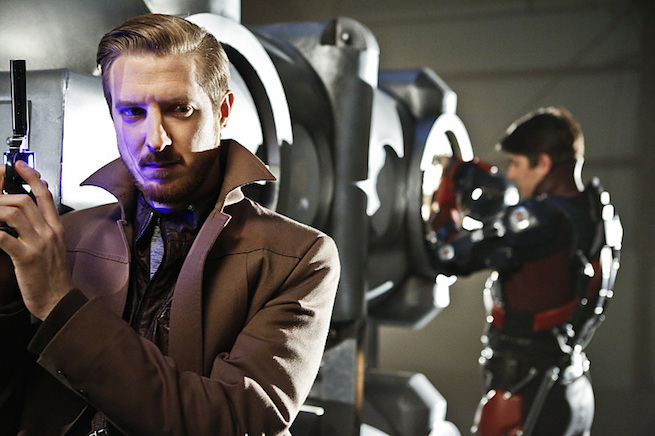 -Arthur Darvill once more deserves some kind of award for his acting. He was great in this episode. His turmoil and uncertainty was plainly depicted. Plus, his rage at the end when he's trapped in the cell was excellent. Wow. -Carter/Kendra/Ray: This side plot has gone on for far too long. It's been all over the place and back and forth so many times that I don't care anymore. I was glad to see it end. Kendra has been bothering me a lot lately, which is sad because I want to like her. But she's so hung up on her love life and not focused on the mission that I just want to roll my eyes and slap her. I feel extremely sad for Ray because he's being the bigger person. He's doing what he can do help Kendra and make her happy, despite his feelings. (Helping Carter even though it means he loses Kendra is a prime example.) I think Ray deserves so much more, and he'd better get it at some point. -Savage easily manipulated most of the team (with the exception of Stein). It was frankly aggravating that the Legends walked right into that one. They purposefully sought him out and then let him talk to them. Don't they have a muzzle or something? He planned everything, and he was in control the whole time. I don't understand why they would go to him first of all people for advice or help. Ray was actually so stupid. Why did he ever think it would be a good idea to fight Savage in his cell? How could he think he had a chance at winning? He could have at least restrained him first. Thank goodness Dr. Stein has a brain. -While I understand Rip's choices haven't always been the best of late, I was kind of disappointed how easily some of the team members switched loyalties against Rip. Most of what occurred with Savage being imprisoned instead of dead was Kendra's fault and not Rip's. She chose not to kill him, since she's the only one that can. Rip can't make her do it. I don't know, it just seems like whenever the team crumbles, bad things happen. And now look what happened. -While handing Savage over to the Time Masters makes sense because they have proof he's meddled and they can intervene now, I don't understand why they didn't just kill Savage. Once Carter conveniently came out of his brainwash, they had no reason not to kill Savage any more. So why didn't Kendra kill him? Carter is fine; he's even alive. The logic didn't make any sense to me. This episode was much better than "River of Time." The stakes were high, but the team worked together to get the job done. I loved it. It was exciting, it was fun, and it was one of those episodes that leaves you feeling good (which is how a super hero show or movie should make you feel at the end). This was a great episode to lead us to the season finale. -The Time Masters controlling the Legends' path was a very intriguing plot twist. (Good job, writers!) It definitely made things more dramatic than before. How can you stop someone who knows and plans your every move? This kind of high stakes deal brings the team together, which was what made this episode fun. -Rory deserves some kind of recognition for this episode. They make it seem like he's going to be turned back into Kronos, but instead, he focuses on the team and tricks the Time Masters. (I bet they didn't see that coming!) He gets his revenge while saving his new friends. Then, he volunteers to stay behind so Ray doesn't die and so it changes the time line of events that Rip saw. Brilliant! I love his character development. -Sara and Snart throughout the whole episode were perfect. This is what I live for. First, they had their face-off with Snart being smart and Sara having a heart. Then their conversation later about the future. Sara's comment slayed me. And finally the end, where Sara kisses Snart. I was not expecting it! I still don't if I really ship them, but I love their dynamics together. -Snart on his own made this episode work. It was his idea to hide, which gave them a chance to save the team. Then, he sacrifices himself to save Rory by staying behind to destroy the Time Masters. This is called character development, people! He's come so far from the thief and criminal he once was. He is a hero. -Savage still killed Rip's family. I was hoping maybe they would destroy the Time Masters in time (get it?) to save his family, but they still died. I'm not sure what the Legends will do in the next episode, but it sure will be exciting! What did you think of "River of Time" and "Destiny"? What do you hope happens in the season finale?